TT: To Vote Or Not To Vote? If you’re looking for the Wednesday Wandering, just page back and offer your opinion on what you think would be the ideal cover for my novel Child of a Rainless Year. Then come back and join Alan and me in a discussion of the vote. with our friend Michael Wester. One of the topics that came up was how to make voters feel their vote matters. This is a big issue for me. As I’ve mentioned elsewhere, growing up in Washington, D.C., I was very aware of being disenfranchised in some parts of our electoral process because of where I lived. However, when I moved to New Mexico, a state with a very small population, I suddenly came alive to the fact that my vote really mattered. Anyhow, on that particular day, we started talking about other systems of government. Michael suggested we ask you how voting and voter registration works in your part of the world. ALAN: In New Zealand, voter registration is compulsory. However, prosecutions for not being registered are unheard of – the courts have better things to do. Every time an election is looming, a vivid orange cartoon man appears on the television exhorting us all to enroll, and explaining just how easy it is. 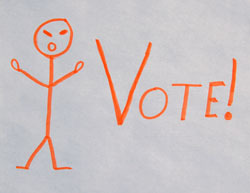 Amusingly, the felt tip pens with which we mark our ballot papers are the same shade of orange as the man. I doubt if this is a coincidence. JANE: Is it the same in Australia? ALAN: No – voting is compulsory in Australia, and while prosecutions for not voting are very rare, they do happen. I know people who deliberately spoil their ballot papers (which is not illegal) simply so as to stick to the letter of the law. JANE: That’s fascinating. As you probably know, in the United States, citizens are not required to vote or even to register to vote. Do you think these requirements make the citizens of Australia and New Zealand more conscious of their rights and responsibilities? ALAN: I doubt it. We’re just as intellectually lazy as anyone else. But I suspect the decisions that we have to make are much simpler than yours are. At election time, we each cast two votes – none of this “one person, one vote” nonsense for us! One vote is for the party that we want in government, and one vote is for the person we want to represent our district in that government. It is a very common tactic to vote for a local representative who is from a different political party than the one you cast your government vote for… As it happens, that’s exactly what I did in our last election. JANE: Okay. Two votes only, but it sounds as if those votes cover a lot of people. Where does your Prime Minister enter the picture? JANE: So the Prime Minister isn’t as much like our President as most people here seem to think. Interesting… Don’t you have any say in your local government? ALAN: We certainly do. We vote for local district councillors and the local Mayor, though these elections take place at a different time from the national governmental elections. In America, you seem to have a lot of elected officials that we simply don’t have. Apart from the Mayor, all our other officials are appointed rather than elected. That makes life a lot simpler for the voting public. JANE: We definitely vote for a lot more offices than you do… In fact, there are times I think we vote for too many officials, to the point that turnout for local elections drops off drastically because people get overwhelmed. While I understand, I think this is an incredibly short-sighted reaction because those local officials (city councilors, members of the school board, and the like) are actually going to have more of an effect on a voter’s daily quality of life than will the President of the United States. I want to continue this discussion, but I need to go write some fiction, so later! This entry was posted on April 26, 2012 at 1:00 am and is filed under Thursday Tangents. You can follow any responses to this entry through the RSS 2.0 feed. You can leave a response, or trackback from your own site. One of the most interesting variants of mandatory voting I’ve run across was in Chile (the system may have changed in the ten years since I lived there). Voting was mandatory and strictly enforced, with voters who hadn’t provided proof that they would be unable to vote on election day (by providing a medical certificate or proof they would be travelling at their local police station in advance) regularly facing serious fines and even jail time. *Registering* to vote, however, was entirely optional, although once you registered to vote you were then legally obliged to vote in all future elections, local or federal, under pain of pain. This is widely acknowledged to have been designed by the outgoing military junta as a voter suppression measure to keep the hoi-polloi from voting. For us, it’s the government’s job to list all voters. I remember in the old days, when an election was called, enumerators would hit every house, listing all adult citizens. Once the lists were compiled, copies of the lists for each polling station were nailed to telephone poles in the district, and everyone was expected to check that they were correctly listed. If you weren’t on it, you could contact the returnining officer to be added, and IIRC could also be inserted o one voting day. Nowadays, there’s a check box on your tax return that gives Revenue Canada permission to pass your name and address to Elections Canada, so they don’t have to chase everybody down. If you don’t get your registration card in the mail, you either call Elections Canada to get on the list, or go to your polling station with suitable proof of residence and are added on the spot. Ditto for provincial and municipal elections. Simple, straightforward, and only about 40% bother to vote! Thanks for adding the Canadian picture! I’d wondered how voting works in other parts of North America. and scroll down to the bottom of the page where you’ll find him pointing up at the results. I read John Wyndham’s “Out of the Deeps” (aka “The Kraken Wakes”) back in middle school, and have always remembered one of its heroes opining something like, “Why was I doomed to be born in a democracy, where every idiot’s vote is equal to that of every sensible man’s?” That seemed anathema to me at the time but, in today’s political climate, I’m wondering if Wyndham’s character wasn’t on to something. Unfortunately, there’s no way to know in advance which voter is sensible. I’ve really struggled with that same issue over the years. The “choice” offered by a poll always seems to be a false one to me. It reminds one of the old “false-choice” scam where the grifter makes a mark feel like they are making a choice, when in fact the grifter determines the end result by controlling the choice options. In some cases, I have foregone the partied candidates in favor of my border collie as a write-in, after all she is highly conscientious and works for kibble. The act of voting implies (to me) that I approve of the choices offered, and I usually do not. I think Frank Herbert had a good notion with his “Bureau of Sabotage” whose role was to protect the public from the tyranny of efficient government.